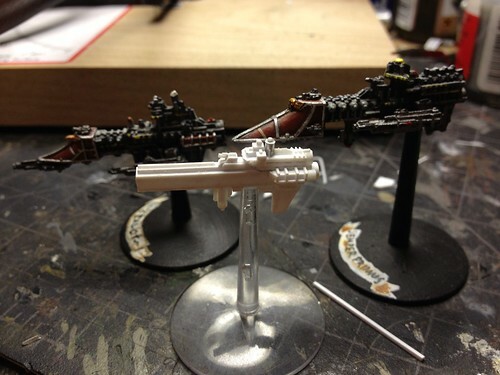 With the GW ships quickly slipping away I figured it was as good a time as any to get to work on this project. I started this yesterday with just the length of the square main section and have built it up over the last two nights. I wanted this frigate to look a bit more compacted than the existing models, with all the usually spread out mass more focused. 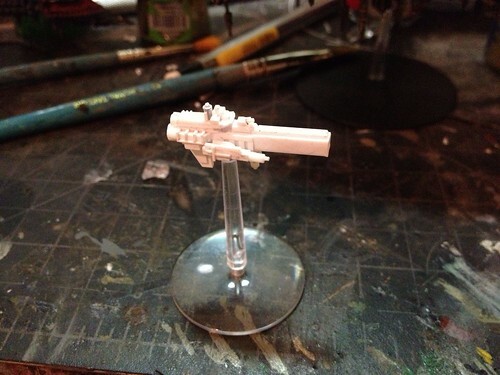 It's a bit more squat looking that the lean and tall bridges on the GW models, though the hull is just about the same length. I am still not sure of where I want to go with the prow on this one. 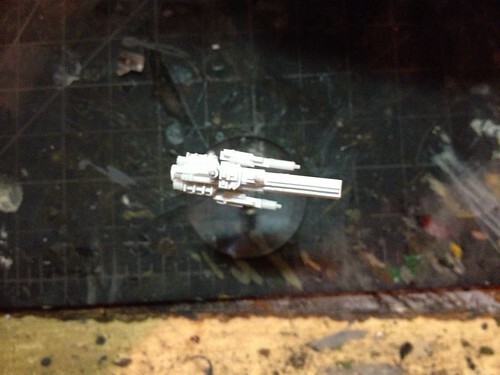 Probably end up with something around a 45 degree slant as opposed to the elongated Sword and Firestorm prows. 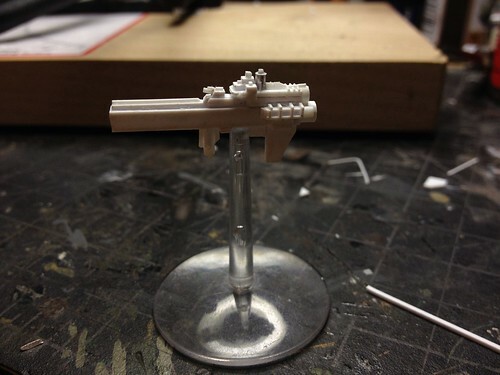 I may end up doing multiple prows so it can be a Sword or Firestorm fill in. Though I think I would rather make another ship entirely to have them stand out more. 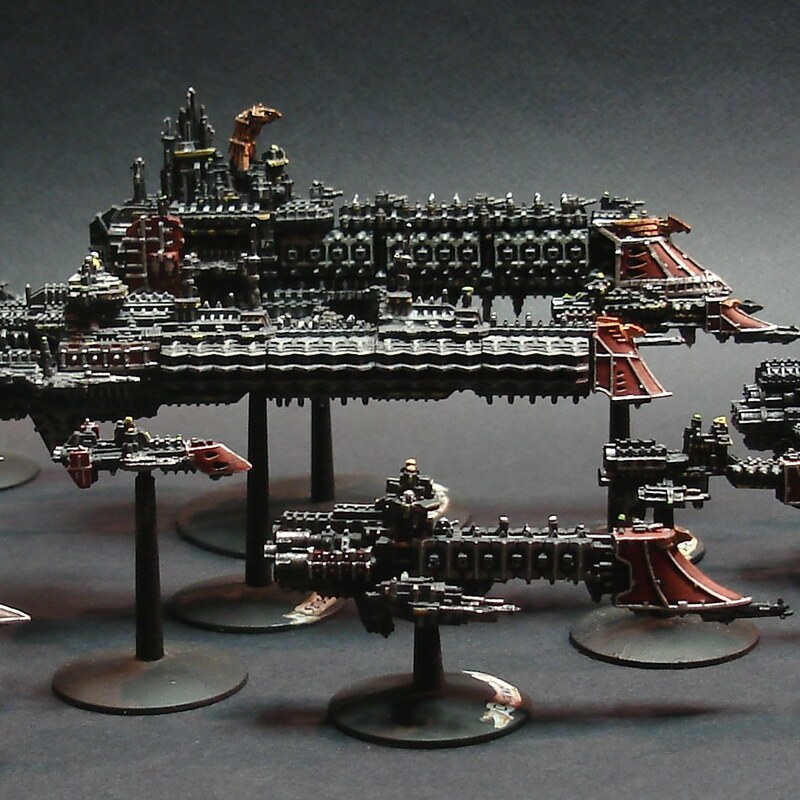 In my own fleet I will probably use it as a Havoc, since they are available to Imperials in the 2010 FAQ document. Next couple of nights I will spend detailing the hull and making the 'wing.' Did not start with a sketch on this one, so I am just going with the flow. I really hate taking pictures of styrene models, but using my iPhone they turned out better than they usually do with my regular camera. coming along nicely so far. Thanks, should have another update tomorrow, hopefully it keeps coming together nicely. And hopefully I stay interested and finish it this week. Sorry for the late reply K-Rad, but I have to say it's an excellent start! 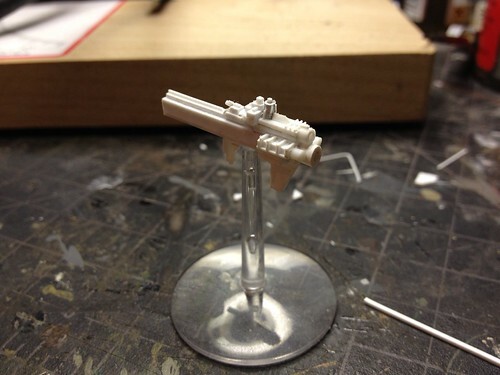 Glad to see I'm not the only one gluing on stupidly small bits of styrene strip (looking at those tiny bits just forward of the top drive tube). It does feel a little small compared to the Sword and Firestorm models you've taken a photo with, but it's hard to be sure. Certainly nailing the size is one of the harder aspects of scratchbuilding stuff like this. A 45 degree prow sounds a good plan - I too am not a big fan of the elongated prows. Very Nice - looking forward to next steps - nice clean lines. It is a bit less tall than the existing models but it is wider to try and make the displacement similar. As for the tiny bits that's the smallest cylindrical rod I have right now I'd like to get some rectangular the same size. Updates will be delayed as I am in the hospital due to my appendix. Really wanted to get more done yesterday and today. So, been out of the hospital for a couple days now and have been home feeling kinda poorly, but at least I can get some hobby work in to distract me. I put another session into the Neptune, this time working on the wing part. I'm happy with how each side came out but I think that it needs to be spaced away from the hull more than it is right now. The pictures did not want to turn out as nicely today. Let me know what you guys think on the Neptune wings, should I make them further from the hull? Should I make them even on each side? That would make it easier to place weapons batteries at least. More fantastic work again Konrad - glad to see you're recovering! The "wings" look perfect and I certainly don't think they need to be spaced out any further. The Ramilies looks excellent! You're forgiven for working on that! What painting process/techniques did you use? For the Ramilles I used drybrushing. I used three tones of GW tans, ending with the bleached bone one, then washed with agrax earthshade and drybrushed again with the mid tone. Still lots of details to pick out with solid colors. 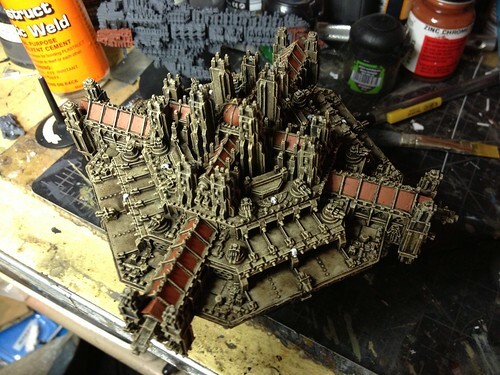 The roofs took me about two hours to pick out with my terra cotta color which matches the prows of my IN fleet. So many towers to work around. Still have to decide whether or not I want to paint the strips in front of the launch bays black or not. As if it's an anti glare precaution more so than an actual tarmac surface. Sorry for the threadomancy, but erm...update? This is just too awesome to let die! I have not worked on this in awhile. Right now there's nothing new to post on it. I've got it sitting right in the middle of my workbench nagging me, but I've been busy with other things and have not had much hobby time since the weather has warmed up. I've been working in more hobby time the last few weeks and left my current project at a friend's house from game night. So, perhaps this week I can switch over to the frigate again.